Annapurna region stands to be one of the most visited places for trekking around the world. The region gets more than +100,000 trekkers per year from around the Globe. No doubt it attracts numerous of visitors as it amazes them with breathtaking mountain views and sceneries. 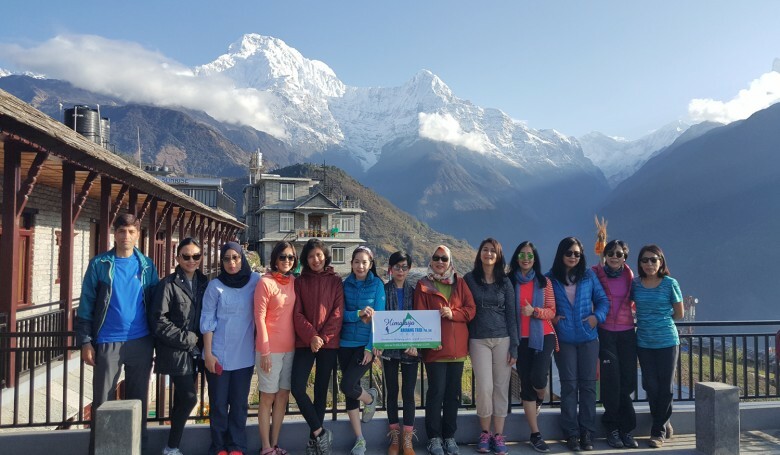 Annapurna Base Camp Trek is one of the most exciting treks to be around the foothills of the magnificent range of Annapurna and Machhapuchhre (or Fishtail Mountain) that provides the trekker with an opportunity to be immersed in the beauty that unfolds amidst the white snows. Furthermore, the trek offers an opportunity an opportunity to embrace the enormity of mountains, and experience to be dipped in the scenic diversity with a close watch to the cultural legacy of the communities inhabiting along the trail. The trekking route of Annapurna Base Camp is devised for adventure seekers who wish to hike the trail for a short period of time. This trek comprises of diverse terrain, culture, wildlife and biodiversity. The adventure to the base camp is quite scenic and when you reach the base camp the views are surreal. Offering you the sight of mighty snow peaks such as Annapurna ranges, Machhapuchhre, Hiunchuli, the trek is simply a paradise for the mountain lovers. The real trek starts from Nayapul to Ulleri. On the way you pass through forests and villages inhabited specially by Gurung people. You will be heartily welcomed by the locals and will get to know about their cultures. Moreover, on your way, you will spot cascading waterfalls. Passing through the tranquil rhododendron forest walking through diverse landscapes, it would simple be an amazing trek. Furthermore, the trail heads towards a deep gorge that slices between 2 peaks – Mt. Hiunchuli & the famous sacred Machhapuchhre peak [fishtail] as we head through dense bamboo and rhododendron forest by the narrow Modi Khola [river] valley and the scenes we witness in transit warm our thumping hearts. The best months to trek to Annapurna base camp are pre-monsoon (February, March, April and May) and post monsoon (late September, October, November and December). You will heartily be welcomed by our representative at the Tribhuwan International Airport. From thereon, you will be dropped at the hotel for relaxing. After that, you will be given a brief orientation of the Annapurna Base Camp trek by our representative. Today, we drive to the beautiful city pokhara from where our journey will begin. The overland journey would take about 6 hours. On the way, we enjoy the enchanting view of Trishuli river, temples such as Tal Barahi temple, Bindyabasini temple and the beautiful sceneries. The snow peaks are the major attractions here. After having our early morning breakfast, we will head towards Nayapul. We will drive to Nayapul from Pokhara. From here, you will trek to Ulleri via Tikedhunga route. You will walk pass the green pasture lands, clean green mountain water streams. Wildering through the charming villages, we move ahead the trail, cross many bridges creating a wonderful experience. Trekkers wake up early to gaze the breathtaking sunrise view from Poonhill. Moreover, catch the hypnotizing perspective of the dawn from the Poonhill. The astonishing panorama comprises of the stunning Himalayas that leaves you awestruck. After the Poonhill exploration, we start trekking towards Tadapani. Ascending through the Deurali pass, we move ahead through the moss covered forest with rich birdlife. Not to mention, the alluring sunset view from Deurali pass will make your trek joyous. Overnight in Tadapani. Today, we trek from Tadapani to Sinuwa. Located on the south of Annapurna, Sinuwa is linked to Hiunchuli by a ridge that drops off an 80 degree wall of snow, rock and ice.You will walk steadily down the hill passing through dense forests. Indulging yourself in the beautiful nature, you trek your way ahead. The stone steps are the major characteristics for this trek. ). After a steady descent, we reached the Kimrung Khola, a river we had to cross to get on to the next range of hills Chhomrong lunch break there and continue trek to Sinuwa. Early morning breakfast at Sinuwa and then we head towards Deurali. The journey starts by crossing a small bridge. The climb is elevated moving forward through a much drier forest before reaching the Hinku cave. Rich in wildlife, the forest comprises of animals such as Deer, Jackals. Not to mention, you will be awestrucked with the stunning views of Machhapuchhre mountain, river below and the sheer rocky cliff on the top of the cascading waterfalls. Today you trek from Deurali to Annapurna Base Camp. The trek initiates from the walk through the river bed over a tapering trail over to the mountain. 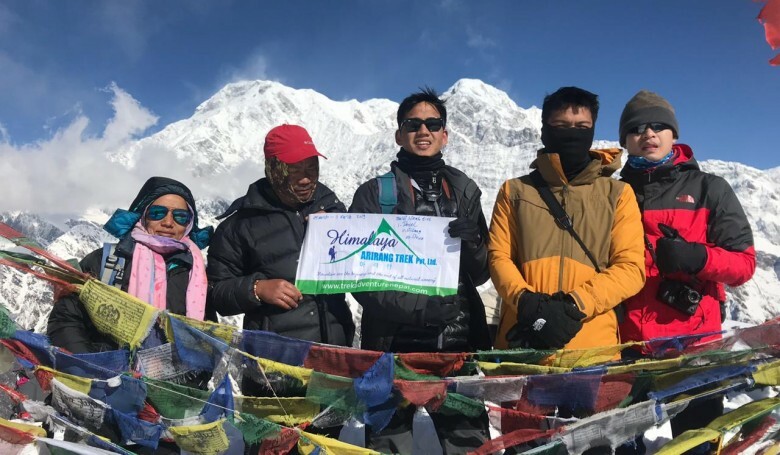 On reaching Machhapuchhre Base Camp you will be rewarded with the stunning views of Machhapuchhre Mountain along with other snow peaks such as Hiunchuli, Annapurna south, Annapurna I, Annapurna III and Gangapurna. Moreover, indulge in the 360 degree view of Annapurna Base Camp. 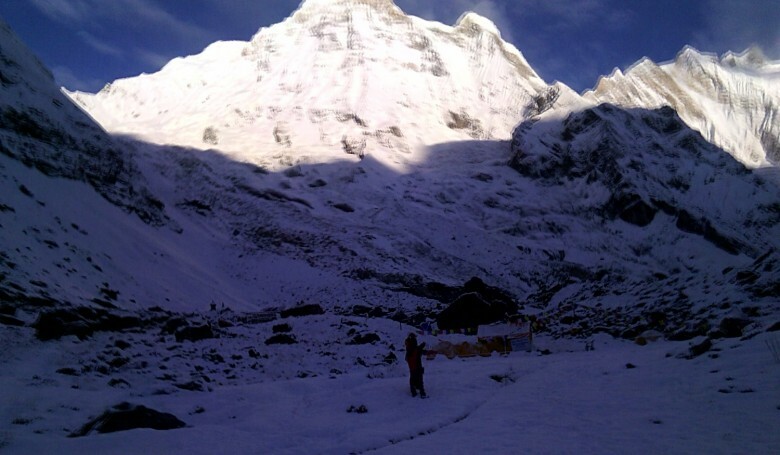 After the early morning breakfast, today you will explore the Annapurna Base Camp. You will be astonished to see the beautiful view from the base camp. Further, the trekking trail continues to Dovan. The trek would take approximately 6 hours. Finally, you have completed your adventurous journey to the Annapurna Base Camp. You will be taking some unforgettable memories from this trek. Today the trekking journey initiates from Dovan to Chhomrong. Approximately, it would be a 6 hours trek through the rhododendron forest. Then you will walk towards Chhomrong crossing the Gurung village. Reaching Chhomrong you will get to see the stunning views of Mt. Hiunchuli Annapurna south and the virgin peak. The trek would be a typical journey to the Gurung village. It is popular for the rich culture of Gurung people and the beautiful society. You will get to explore the culture the tradition of the Gurung people and would simply enjoy the warm hospitality. Today you will trek back to Nayapul from Ghandruk. On the way you will get to enjoy the spectacular Himalayan landscapes along with the jaw dropping mountain views. Walking through the river banks of Modi Khola and the cascading waterfalls at the middle of the trails, we stop by at Birethanti for relaxation. After that we continue the trek towards Nayapu, crossing the Modi Khola bridge. Overnight at Pokhara. After an early morning breakfast we head towards Kathmandu. We drive to Kathmandu on a tourist bus. It would take about 6 - 7 hours to reach Kathmandu. Reaching Kathmandu, you will be dropped off at your hotel for relaxation and get ready for the farewell dinner. Overnight at the hotel. After having your breakfast, you can have a relaxing time shopping in the city. At the evening our representatives will drop you off at the Tribhuvan International Airport. Not to mention, you will be taking tons of memories of the trip. Accommodation star hotel with breakfast Kathamndu and Pokhara. Tourist Bus from Kathmandu to Pokhara both way. 3 meals a day while trekking (Breakfast, Lunch & Dinner) as indicated by the itinerary. Accommodation while trekking in twin sharing basis local lodges / guesthouses. Note:Kathamndu to Pokhara roundtrip airfare is extra if need domestic flight. Trekking Region:Annapurna Base Camp Trek.